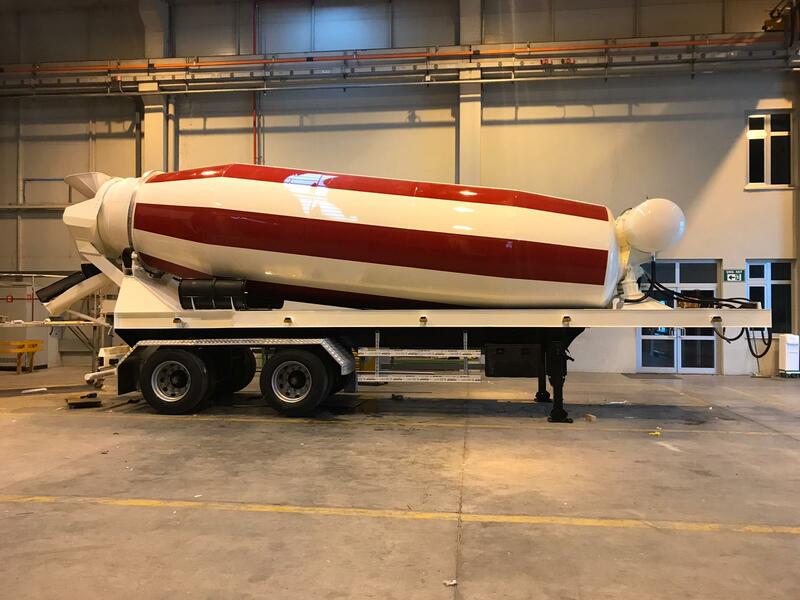 Powered by the lithium battery system based electric hybrid drive, which enables the vehicle’s internal combustion engine to be shut down when it reaches the site and the work is carried out on a quiet electric drive. In this case, the magnitude of the carbon footprint is determined by the generation of battery charging power. 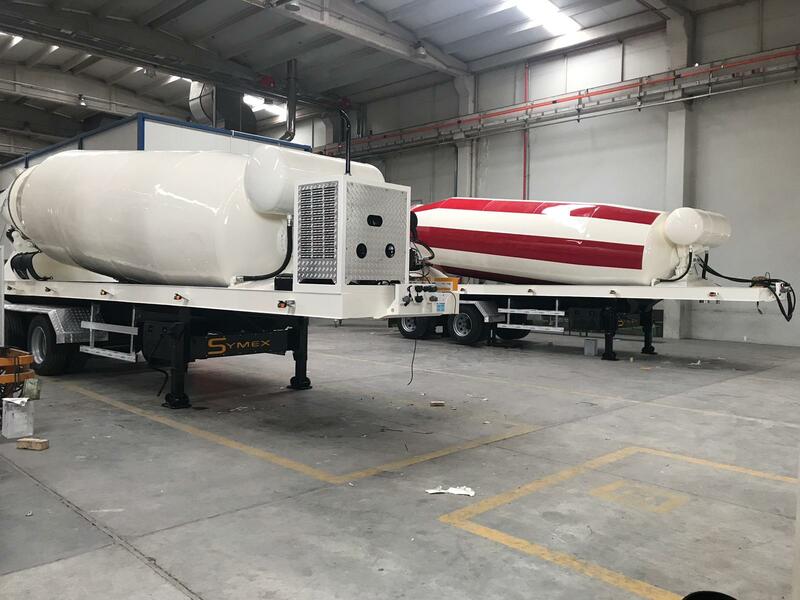 The equipment can utilize under transportation charging for braking energy recovery as well as, under certain driving conditions, the energy loss of the engine to generate battery charge. 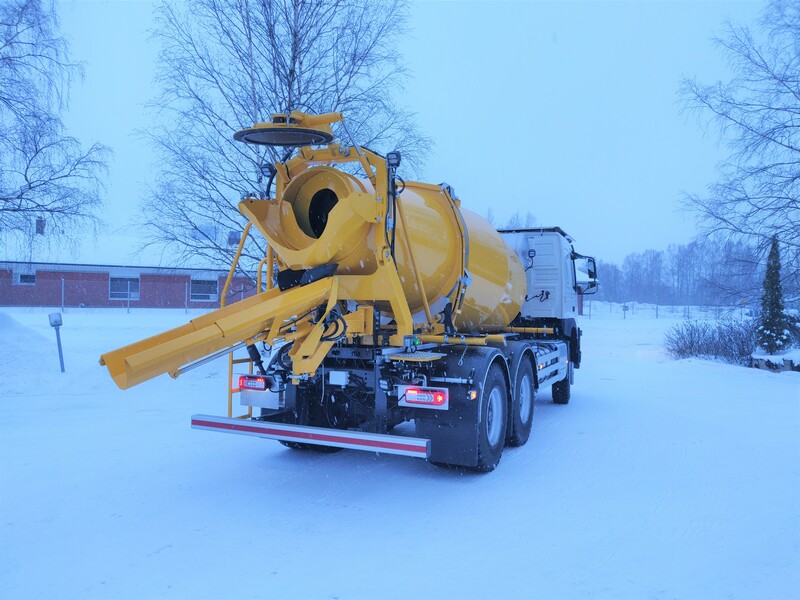 In the built-up areas during late hours, night and early morning work, the noise generated by the site can be significantly reduced by hybrid driven equipment . In addition to reduced noise emissions, electric power also contributes to reducing the risk of small particles and toxic exhaust emissions from cities and especially in confined spaces and underground construction. 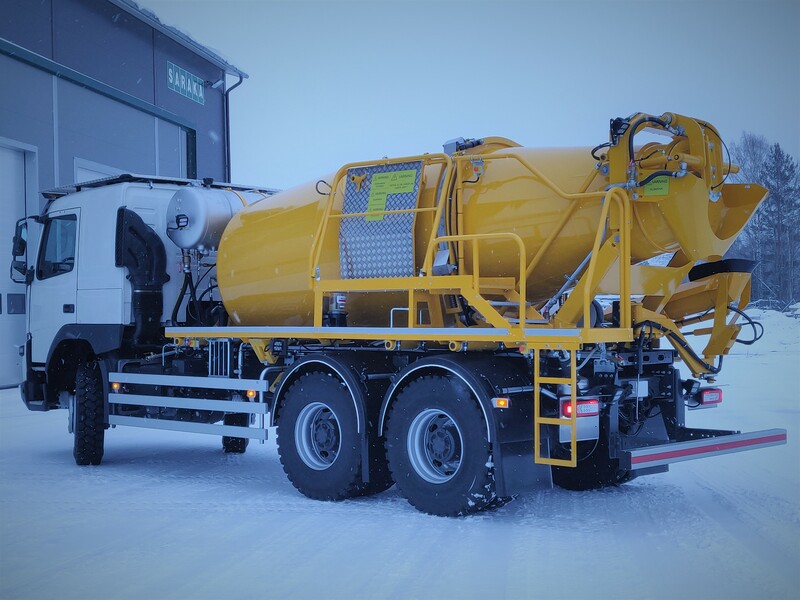 The SARAKA’s lower torque demand for rotation means that the superstructure is exceptionally well suited for mounting on a gas-powered chassis. 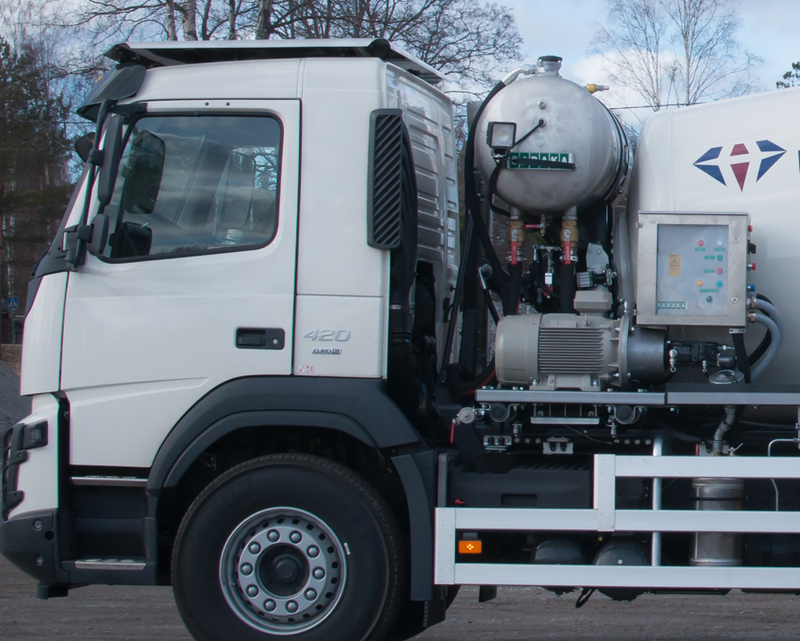 CO2 emissions from transport can be reduced by approximately 90% when choosing LNG / CNG as a fuel, or even nearly CO2 neutral when using biological gas recovered from waists in the form of LBG or CBG. The range is about 1,000 km for liquefied gas and even hundreds of kilometers for pressurized gas. 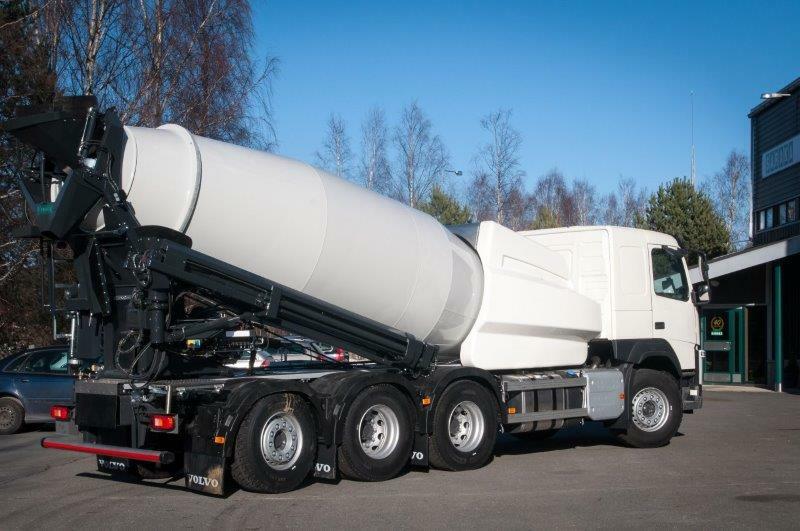 The legal payload for the Volvo FM concrete truck with superstructure consisting of SARAKA LSB 9 B + BigReach HR-11 telescopic drop chute is over 7 m3 to a total weight of 32 000kg. SARAKA HYBRID DRIVE is also availavle as extremely light Plug In-version. Just plug in to standard 400V/63A electric network on the site and work quietly and without emissions. 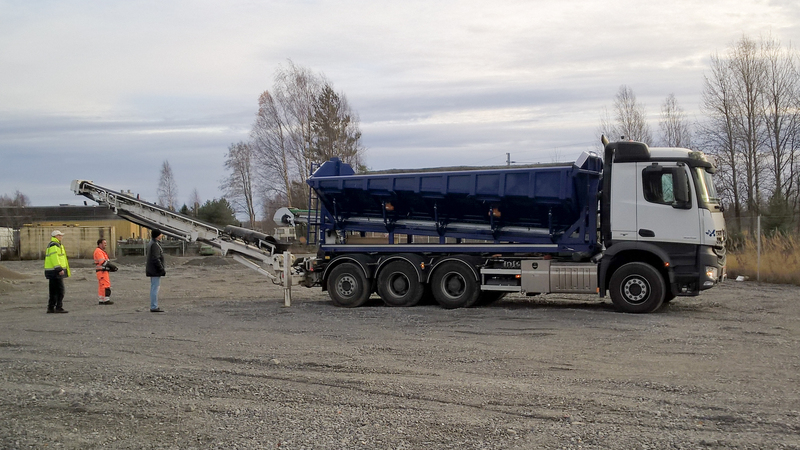 With SARAKA HYBRID truck equipped with BigReach Drop Chute the truck operator can alone fulfill the castings running quietly and emissions free on site. Work area is 95 m2 without moving the truck and casting can be made up to 1 m height on all areal. By choosing chassis with gas engine the emissions of transportation can be reduced to almost zero. As the mining industry continues, the distance increases in between the surface batching plant and the mining industry down below. Limited speed of the dumper mixer without suspension keeps decreasing the productivity by increased transportation time. 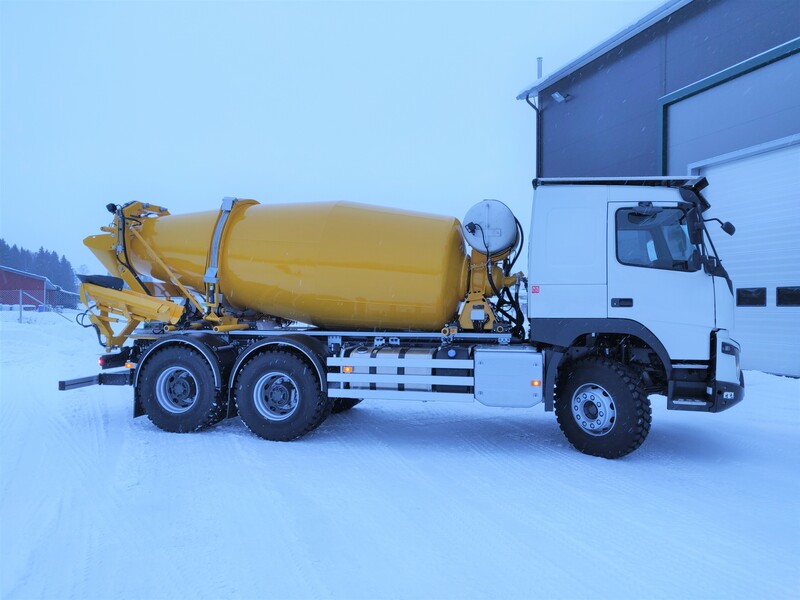 For these very challenging driving conditions, SARAKA has developed a flexible and rigid superstructure that has proven to be excellent in even the toughest conditions. 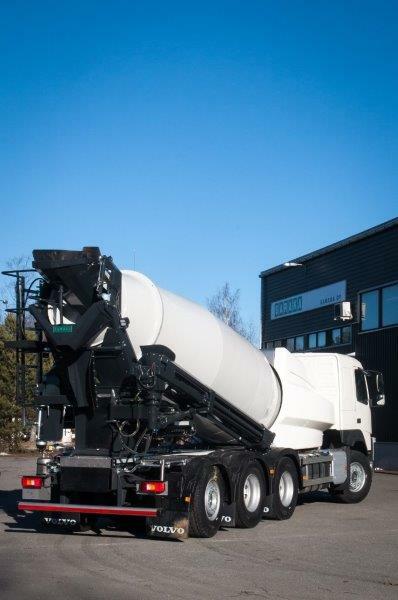 LSB GN series includes sizes 8 m3 and 9 m3 for mounting on 3-axle chassis and 10 m3 and 12 m3 mixers for 4-axle. 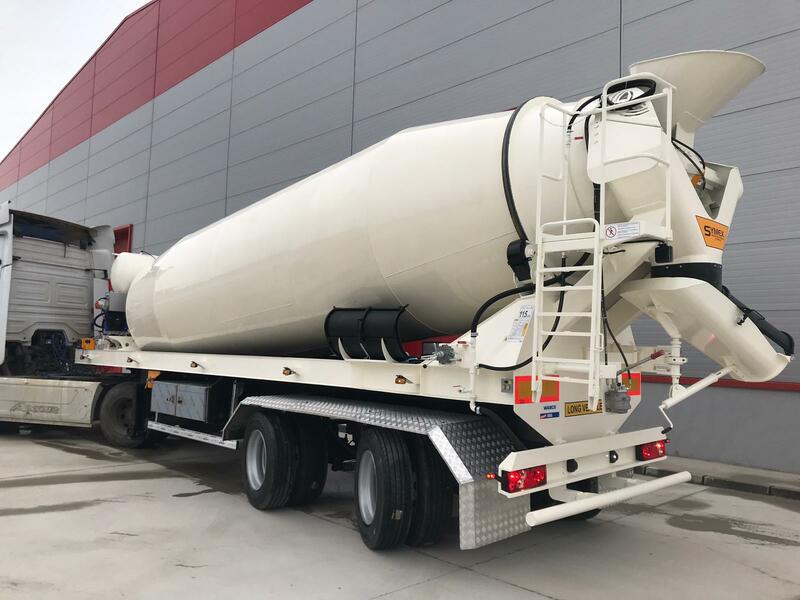 SARAKA long bogie semi-trailer is equipped with 12 ton BPW Twin-wheel axles with electro hydraulic VSE steering from 5th wheel + over drive with radio remote control on low speed. The tire size of the twin wheels on both axles is 275/70R22.5 and the steering angle 22.5 degrees in both directions. 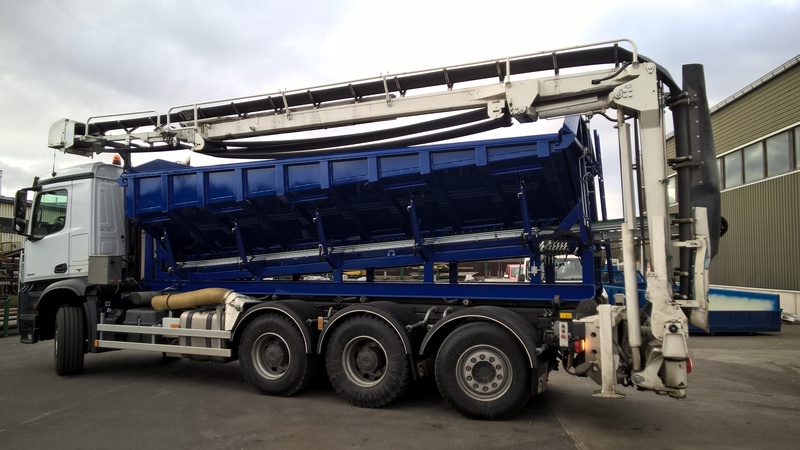 This special SARAKA Tipper, equipped with the TTB 16,5 m telescopic conveyor is designed for effective and exact placing of fixed materials. In line with our original ideology, we strive to develop new work methods for our customers and to manufacture appropriate devices that can significantly improve the profitability of work. Strap is a typical example of such a product idea: the technology and components required are mostly standard goods for our normal production, but applied to a completely new industry. 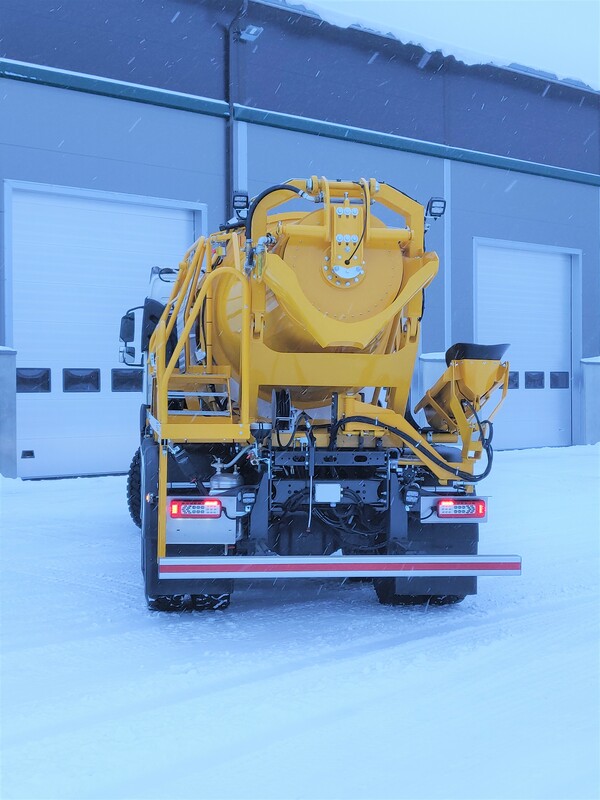 On the construction side, concrete trucks with a belt have been used for a long time for controlled application of solid masses. The bottleneck has been loading the device, which must happen through the hopper. In the belt bucket, this problem has been removed and the load can be loaded freely at the site with a bucket loader or excavator.